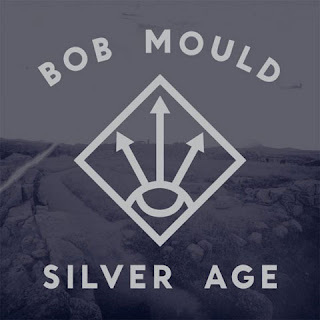 First off, please allow me to refute a phrase I keep seeing in other reviews of Silver Age: this fantastic album is in no way a “return to form” for Bob Mould. If anyone really thinks that it is, I beg of them to give his last two, 2008’s District Line and 2009’s Life and Times, another try. They’re both fine records chock full of the emotionally and melodically engaging material that Mould’s name is practically synonymous with. What Silver Age does represent is a return to a band feel, reminiscent of Mould’s early ‘90s time fronting Sugar. The main difference between Mould’s last few albums and this one is the livelier, more off-the-cuff feel of its production and presentation, and that’s entirely the difference between mostly going it alone, as he did on his last few albums, and recording with sympathetic accompaniment, as he does here. I can’t say enough good things about bassist Jason Narducy and Superchunk drummer Jon Wurster, and the electric charge they’ve brought to this batch of songs. And what a selection of songs it is. Every now and then, even an artist as consistent in writing quality as Mould comes up with a batch of new ones that’s juiced with that little something extra. It’s an intangible quality, well beyond what a critic can describe in words, but as fans we all know it when we hear it. Delving into Silver Age’s individual tracks is nearly pointless: they’re all top caliber, and they all bounce off one another in that way that only happens on truly special albums. The lead single, “The Descent”, is a good choice as far as a four-minute sampler for the album goes, but really: if you’ve ever loved any facet of Mould’s career, Silver Age is a sure bet. His current live show is also a sure bet: opening with the entirety of Sugar’s 1992 debut Copper Blue, surely one of Mould’s absolute career highlights, then offering a good chunk of the new album before settling into a final run of Hüsker Dü classics, his performance at Williamsburg Park in Brooklyn last Friday night was a complete winner. I haven’t always been sold on Mould playing the Hüsker catalog with other bands, but Narducy and Wurster are absolutely the right men for the job. The latter in particular was able to incorporate the signature idiosyncrasies of Grant Hart’s drumming into his own, more tutored playing without sacrificing the character and charm of Hart’s original parts. As for Mould, he’s never seemed so at ease with himself and his songs as he does right now, and it shines through in his performance. One of the evening’s more memorable moments came courtesy of Hold Steady frontman Craig Finn, who guested on vocals for a rousing version of Hüsker Dü’s classic “Something I Learned Today”. By any objective standard, Finn’s performance was so-so: his vocal style isn’t a great fit with the song, and he seemed to get a bit lost lyrically here and there. So why was it great? Because he was the embodiment of everyone in the audience: the wide “I can’t believe I’m singing a song from Zen Arcade with Bob Mould” grin wasn’t something he could have faked if he tried. He, like myself and the rest of the assembled crowd, probably grew up with and to Mould’s music, and let’s be honest: if Mould asked me to sing “Something I Learned Today”, I’d probably goof up out of excitement a few times, too. To grow up with an artist’s music is an amazing, personal thing, and Zen Arcade is certainly one of those albums that a lot of folks somewhere between my and Craig Finn’s age grew up to. To be able to continue to grow with that same artist’s later work is the mark of true greatness: Silver Age means as much to me right now at thirty-eight as Copper Blue did at eighteen, as Zen Arcade would have meant to me a year or three before that if I’d been cool enough to know about it then. Really, there is no greater compliment one can offer an artist than that. And here it is: the beginning of the end. Honestly, as a fan I’ve been fearing this would happen for a while. I’m not really sure what Bun E. Carlos’ angle is: he’s “in” Cheap Trick, but hasn’t recorded, played live, nor allegedly spoken to any of the band members in the past two and a half years. If that’s the case – if that’s all that’s really required to be in the band – then I’m proud to announce that I’ve been the drummer in Cheap Trick since early 2010. Hell, I’ve probably spent more time with the band than Bun E. has since then. Oh, sure, they were on stage and I was in the audience, but details schemtails. Before we delve any further into this debacle, I want to make one thing clear: I have nothing but the utmost respect for what Bun E. Carlos has achieved in his career as a drummer. At his peak, I believe that there were few better Big Beat drummers in hard rock of any stripe. He has an immediately identifiable playing style, and that’s something that very few rock musicians can claim. His peak lasted a good thirty years or so, too. That’s no small potatoes. Somewhere around 2006, things started to change. The band released Rockford that year, by most appraisals their finest work in many a moon…and then proceeded to play less than half the record live. This was a major change for the group; previously, they’d always enthusiastically spotlighted their new music in performances. It was also around this time that a large amount of setlist fatigue started to settle in: essentially, the band had two setlists: Headlining show (75 minutes) and opening act (45 minutes), with only a song or two ever varying. I don’t think there was a single big fan that didn’t get very sick of the “Hello There” into “Big Eyes” opening two-fer in this era. Most whispers and rumors attributed all of this to Bun E., long known as the band’s resident setlist writer. Is that just rumor? To a certain extent, but the proof is in the performances: since Bun E.’s “hiatus”, the band’s performances have grown longer and more varied. Also more enthusiastic: it has been a wonderful thing to watch Robin Zander become progressively less stoic over the past couple of years. As a fan, sure, I missed the original lineup. But Daxx Nielsen’s a fine drummer in his own right, and watching the band rediscover some of the dustier corners of its massive catalog is the sort of thing that makes one happy to be a fan. I was wondering when the question of who’d be playing on the next album – and the potential legal ramifications of that – would come into play, and apparently the answer to that question is “now.” First off, I think it’s bad form on Bun E.’s part to try to escalate this over a contribution to a charity album. Whether he’s got a point or not, there’s no way that a potential lawsuit over a song for a Very Special Christmas album can paint anyone in a sympathetic light. Secondly, there’s the elephant-in-the-room part: if Bun E. Carlos hasn’t recorded, toured, or even spoken with the other three members of Cheap Trick in two and a half years, then it’s safe to say that he is not even remotely a “full member of Cheap Trick in all respects.” I’ve mentioned before that I’ve thought he was a bit delusional about his status in the band, and this pretty well proves it. He is a grown man, as are his bandmates: either figure out a way to work together, or let the lawyers start hashing out the severance package. The current state of limbo is frankly ridiculous, and if it ends up effectively ending the band’s time as a recording act then everybody who’s got an interest in this loses. The band suffers an ignoble end to a largely distinguished career, and the fans miss out on at least one more chapter in the group’s late-period creative renaissance. The Latest was a fine LP. Until today, I hadn’t even considered the possibility that it might also be The Last. Dear everybody involved: stop this game. Thank you.